There’s a war being fought out over the internet right now – and the first victim in this explosive war of words is the truth. 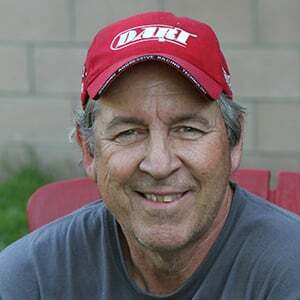 So we decided to talk to Director of Engineering for Autolite, Jerry Reeves, who not only knows this subject really well, but is a car guy, too. What we’ve learned will hopefully dispel many of the myths and old wives’ tales surrounding the spark plug. One of the most contentious areas of disagreements surrounds fine-wire spark plugs. It seems that everyone has an opinion about platinum and iridium plugs compared to the standard copper-core version. We’ll just start by saying that there’s a good chance that whatever you’ve read or been told about fine-wire plugs is probably incorrect. This compares an extended-nose plug (left) to a standard-reach plug (right). Note how much longer the extended-reach plug’s ground strap is compared to the standard-reach. For street engines, the extended-nose is good for part-throttle efficiency. The short- reach is far better for high output engines where the longer ground strap could get hot enough to cause pre-ignition. First, we should define the terms “detonation” and “pre-ignition”. We’ll start with detonation, which is an uncontrolled combustion pressure spike that can occur at any time, even before the spark plug fires. This can occur as a result of high cylinder temperature and/or pressure that causes the air and fuel to self-ignite. Pre-ignition is where combustion initiates before the spark plug fires as the result of an extremely hot, glowing ignition source in the chamber. Many times this is traced (but not limited) to a long ground strap used on an extended-nose spark plug. If you pay close attention, you’ll notice that most racing plugs do not employ extended-nose center electrodes. This keeps the ground electrode short, minimizing its path to the cylinder head where the heat can be dissipated. 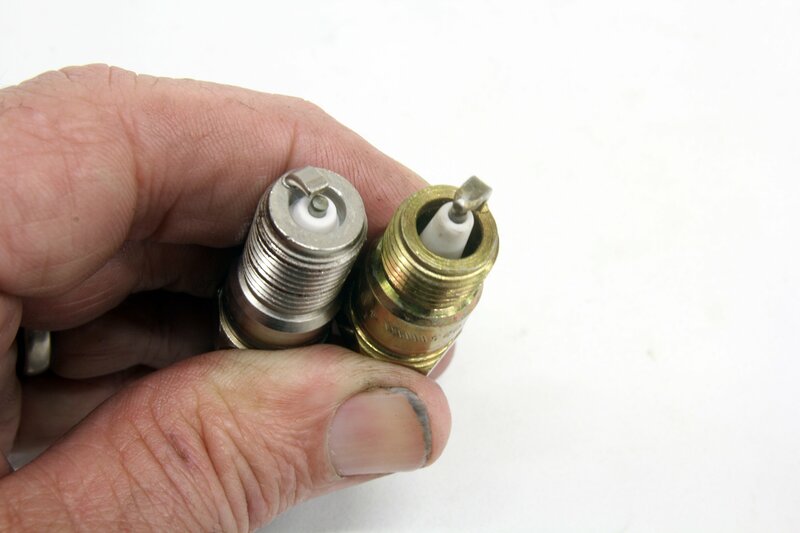 Fine-wire plugs like this Denso Iridium (left) requires much less voltage to fire the same spark plug gap versus a standard copper-core plug (right). This Denso plug is called a U-Groove referencing the U-shaped ground strap. We should also define the term “copper core” when talking about spark plugs. Copper is used as the core material for nearly all spark plugs. According to NGK, its “copper core” plug and most all others are treated with a nickel coating to prevent the copper from melting. This applies to fine-wire plugs as well, which use a copper core to improve conductivity. A spark plug’s heat range is a major factor in engine tuning, and as a result, should be given the attention that it deserves. The heat range is established by the distance the heat in the center electrode and insulator ceramic must travel before it contacts the steel body of the spark plug. 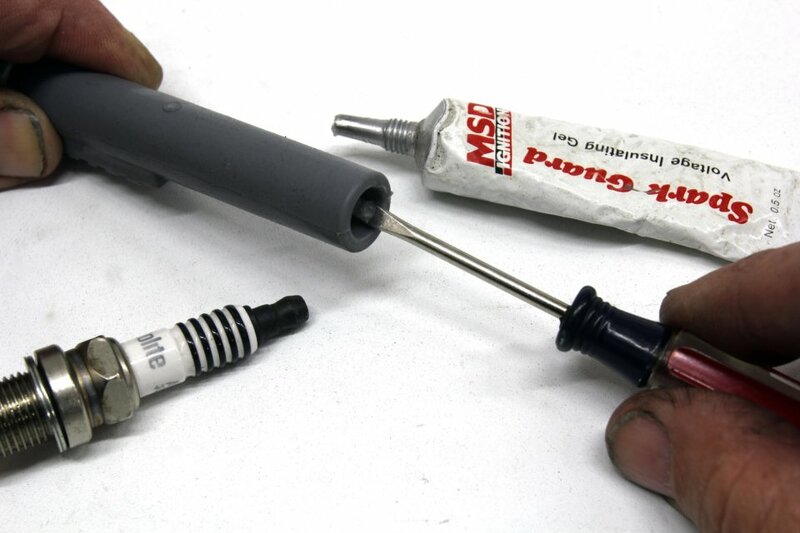 A “hot” spark plug lengthens the depth of the ceramic which lengthens the distance from the center electrode end of the plug to where it contacts the spark plug shell. From there, the heat is dissipated into the cylinder head and eventually into the cooling system. The path for heat to escape from the center ceramic to the plug’s steel body is at the very bottom of the steel shell. Cold spark plugs offer a shorter heat path to the shell. Most competition engine builders commonly choose a colder heat range plug to prevent possible engine damage. The addition of precious metal in the center electrode has nothing to do with the heat range of a spark plug. The heat range is designed into the relationship of the ceramic to the plug body. The plug on the left is a cold plug with a shallow ceramic depth. The plug on the right is a much hotter plug with the ceramic connecting with the outer shell much deeper. Fine-wire plugs were designed for use in late model engines that are tasked with the seemingly ridiculous goal of lasting for 100,000 miles in a production engine. Reeves says the single- and double-platinum were employed strictly as a measure to increase the durability of the spark plugs. The move to iridium plugs could potentially be a performance advantage. An iridium plug uses an extremely fine wire (0.5 to 0.6mm or 0.019-0.023-inch) that, because of its small size, can reduce the required coil voltage by as much as 20-percent. This means there’s an even greater reservoir of voltage at the coil if the cylinder requires it. Fine-wire iridium plugs can improve the combustion process even if there is a high level of exhaust gas dilution—built-in EGR—as with engines with long-duration camshafts with a greater amount of overlap. We removed the threads on these two plugs to illustrate heat range. The plug on the left is a hotter heat range than the plug on the right. Note how the hot plug’s ceramic has a longer path from the tip of the plug to where the ceramic contacts the plug’s shell and then to the head. The colder plug on the right has a much shorter path for the heat to travel; it pulls heat more efficiently from the plug tip so it will not burn off carbon as easily. We’ve seen statements from tuners claiming that fine-wire plugs run “hotter” than normal plugs and that you should avoid fine-wire plugs especially in supercharged or turbocharged applications. Reeves points out that the facts support the exact opposite conclusion. As an example, the supercharged production 2018 Dodge Hellcat—which makes 707 hp from its 6.2L Hemi—specs an iridium spark plug. If you want another example, there’s the 350 hp Focus RS turbocharged four-cylinder Ford engine that pushes as much as 25 psi of boost, and it also employs an iridium plug. 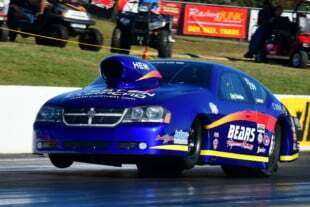 Let’s look at some facts that support why fine-wire plugs are a good choice for a performance engine. A commonly-held, yet mistaken conclusion is that the center electrode contributes to pre-ignition because iridium and platinum are poor conductors of heat. While the fine wires are indeed poor conductors, Reeves tells us that the addition of the precious-metal portion of the center electrode contributes only a small amount of heat and is not a source of pre-ignition. This is a used plug from a small-block Chevy that had started out with roughly 0.040-inch gap and the copper core has worn to 0.050-inch. A wider gap increases the load on the ignition system, demanding higher voltage. Replacing this with a fine-wire plug would allow running a decent plug gap and still offer the potential for improved combustion. The copper core does transfer a significant amount of heat. Reeves emphasized that the heat range rating of a copper-core spark plug and an iridium plug will be the same and that it is the tip (overall) length of the center ceramic that determines any plug’s actual heat range. The center electrode’s precious-metal material does not contribute to the heat range, nor is it a factor with regard to pre-ignition. 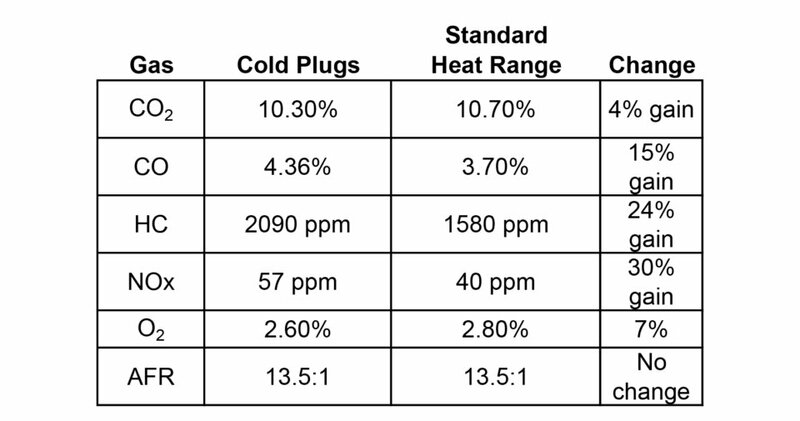 A common question with performance engines is selecting a spark plug heat range. A tuner will often spec a heat range one to three steps colder than the stock heat range. This often is a result of dyno test data where the colder plug appears to work just fine. But then on the street, this cold plug fouls sooner because there is insufficient heat to burn off the carbon deposits. 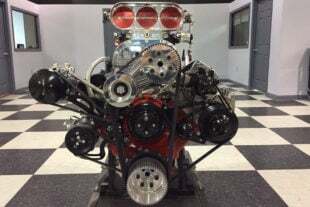 We recently added Holley’s Sniper EFI to a 468ci big-block Chevy, and while it seemed to idle well, we used an EMS 5-gas exhaust gas analyzer to help us dial in the timing and fuel. Then we discovered the engine still had the cold spark plugs in it from the previous year’s dyno test. The plugs were two steps colder than the stock heat range and appeared dark and soot-colored. We recorded the idle quality numbers from the EMS analyzer and then installed stock heat range plugs that were two steps hotter and were of a single-platinum configuration. The engine did not appear to misfire with the cold plugs. The change to the hotter plugs improved the idle quality only slightly by reducing the unburned hydrocarbon (HC) count along with a slight improvement in CO2 which is an indicator of combustion efficiency. So thecombination of increasing the heat range, and the platinum center electrode contributed to making the engine idle better, cleaner, and more efficiently. We’ve also run across opinions claiming that a copper-core plug will somehow burn off carbon deposits more efficiently than fine-wire plugs. This is also incorrect and relates back to our earlier point that a fine-wire electrode has no impact on heat range. 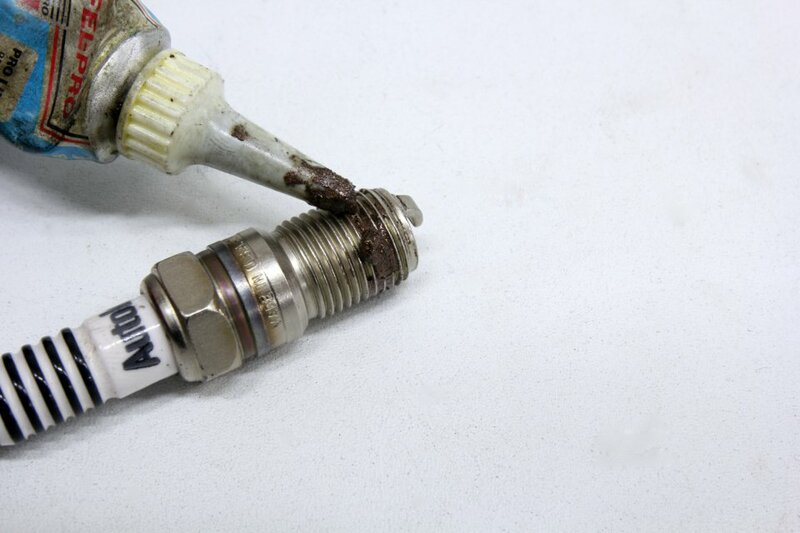 Spark plugs with a hotter heat range will burn off carbon deposits more easily than a colder plug. “As an example, an Autolite copper 105 versus an XP Iridium 105 will have identical ceramic temperatures and the carbon burn off will be the same,” says Reeves. A spark plug’s reach is defined as the length of the threads. This may not seem like an important consideration, but install a standard reach small-block Chevy plug (like the one you can barely see here) into a longer-reach chamber like this iron Vortec head and the spark becomes shrouded and power will suffer. We’ve seen a 20 hp loss from incorrectly installed plugs like this on a 500 hp engine. The way an engine is used has a big effect on choosing the proper heat range. 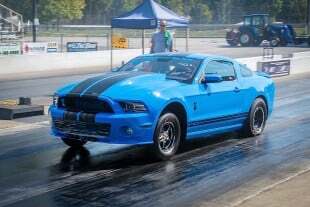 An example might be a dual purpose street/drag car, especially if it uses a power-adder like nitrous or supercharging. For subdued street driving, a standard heat range, extended-nose spark plug would be a great choice, but only if the engine is not called upon to make maximum power. That’s walking a very fine line. For high-load, max-cylinder-temperature track excursions, a colder, standard nose or even surface gap plug is the wisest choice. MSD’s Spark Guard is dielectric grease used to protect the boot from sticking to the spark plug and minimize errant spark leakage. Do not smear it on the connector to the spark plug. This grease is an insulator not a conductor. Place a small amount around the inside of the boot. Your ignition system will thank you for your attention to detail. 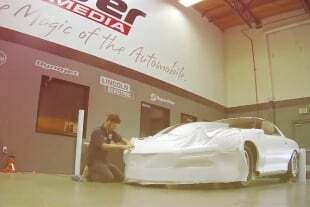 As power from late model engines continues to escalate, selecting a spark plug that will live and not contribute to problems becomes a much more difficult assignment. 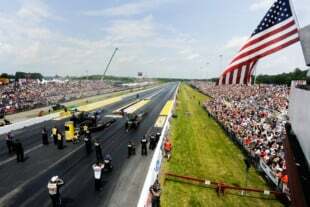 High horsepower engines and especially supercharged, nitrous, and turbocharged powerplants making four-digit horsepower are increasingly susceptible to pre-ignition. For tuning these engines, it’s best to start with a very cold plug with a short ground electrode. Ground electrode length is not a function of heat range. So for power-adder applications, its best to avoid the projected nose spark plugs, keeping the ground strap length short. Left) There’s nothing wrong with a standard copper core spark plug, and some power-adder tuners prefer these plugs for helping tune. These plugs are inexpensive and should be considered a consumable. This is an Autolite race plug that is also configured with a side gap. (Right) This melted plug was destroyed when the nitrous system went lean. While it is a platinum plug – that had little to do with its failure. The plug melted because of excessive heat in the chamber. Likely the air-fuel ratio was excessively lean. While spark plug gap does not have a direct effect on timing, excessive gap in a power adder application can easily cause engine misfire. While a standard gap of 0.035-inch works well for naturally-aspirated engines, if the plug wires are in good shape and the ignition is strong enough, many naturally-aspirated engines might benefit from a slightly wider gap of 0.045 to perhaps 0.050-inch. Spark plug companies don’t recommend anti-seize on threads because it lowers the torque required to install the plug. 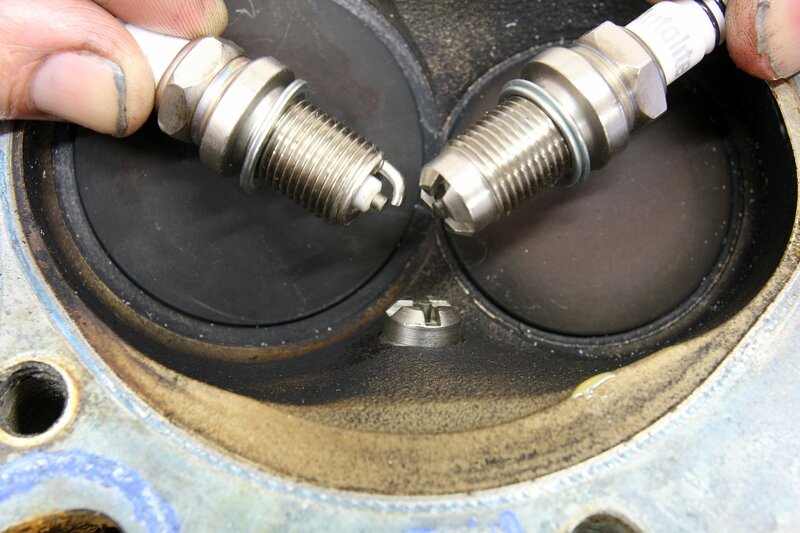 Torquing the plugs to the published spec with anti-seize overtorques the plug which potentially could break the internal seal between the insulator and the shell, creating a leak path. So it’s best to install spark plugs dry. Conversely, supercharged, turbocharged or nitrous applications will demand a narrower plug gap of 0.025 to 0.030-inch. Another idea that can offer potential advantages is a cut-back ground electrode where the ground strap is cut or filed to uncover the center electrode. With less mass in the strap, it does not remove as much heat from the initial flame kernel. As the ground strap length increases, this adds more mass and can slow the growth of the initial flame kernel. Cut back ground straps are also useful in applications where a standard strap may interfere with the piston dome. (Left) Often, a projected-nose plug (shown on left) with a long ground strap can build excessive heat and cause pre-ignition issues. Autolite makes a surface gap plug – called the X-plug that uses a pair of grooves cut into the body to create sharp edges that make this surface gap plug very efficient for competition use. This is a cold heat range plug so may not be a wise choice for every day street use. (Right) Sometimes a shorter spark plug can improve clearance with tight-fitting headers. These three spark plugs are all tapered seat, projected nose yet when lined up at the seat, they are three different lengths. 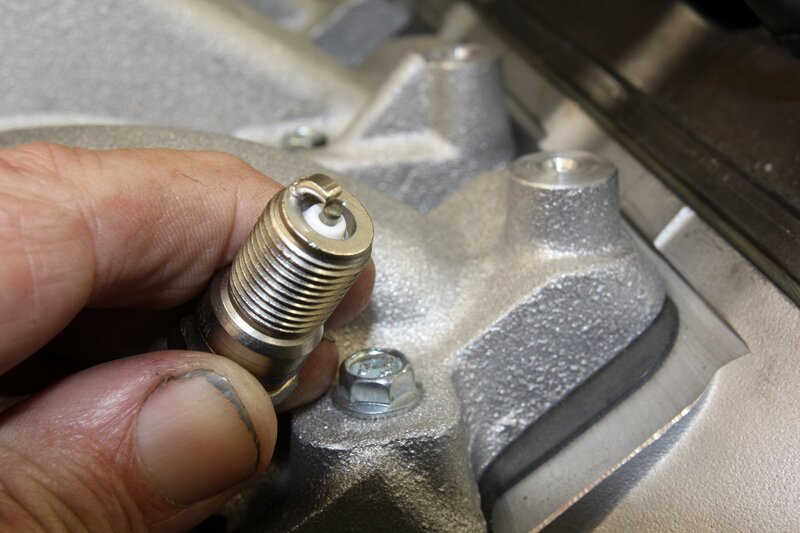 So you might look around for a shorter plug to create more clearance for the spark plug boot. The disadvantage is this will concentrate the spark on one side of the center electrode. With a traditional copper-core plug, the center electrode will wear much more quickly and the gap will increase. This is a trick that is perhaps best left to short-duration race engines. Another option for power-adder applications is to choose a surface-gap plug. Autolite offers the X-series of plugs that has slots cut in the end of the plug, creating sharp edges that make it easier for the spark to jump the gap. To increase the plug gap using a simple gap tool, place the end of the ground electrode in the hole and carefully push down on the end of tool. Reeves warns that a too-wide gap can create the situation where the spark fires sideways to the edge of the plug. While the spark still occurs, it can retard the timing by as much as two degrees. There is much more material regarding spark plug design and usage than we can cover here in one story. Even with late-model fuel injection and data logging, reading a spark plug is still a viable art that is an important part of tuning. Hopefully we’ve managed to dispel a few myths and provide facts that you can use to make your next tuning decisions a bit more accurate.